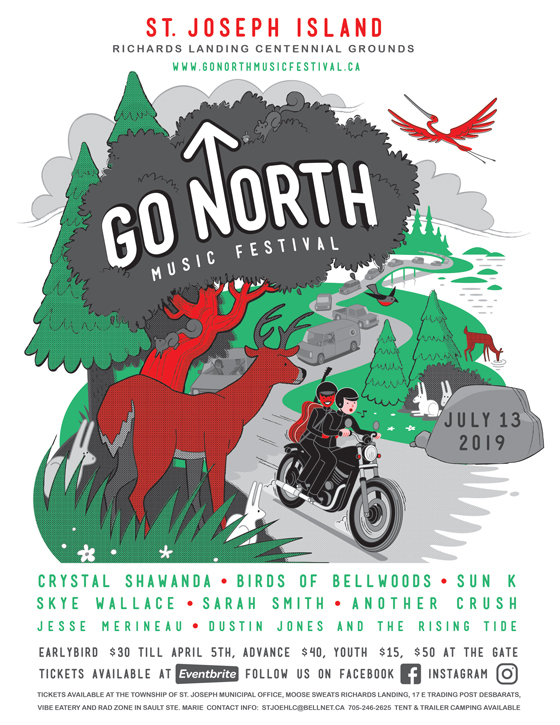 Ontario's Go North Music Festival is gearing up for its third straight year of music-making, and organizers have now lifted the curtain on the event's 2019 lineup. Taking place July 13 on St. Joseph Island, the single-day event will feature performances by Crystal Shawanda, Birds of Bellwoods, Sun K, Skye Wallace, Sarah Smith, Another Crush, Jesse Merineau, and Dustin Jones and the Rising Tide. Starting this year, the festival will also offer camping on the Friday night (July 12) ahead of the festival. "We will be expanding our popular campground experience to have the option of staying on the Friday night as well, to give people the chance to explore St. Joseph Island a bit more as well," festival organizer Jody Wildman said in a statement. "We welcome people bring their own musical instruments and getting together around the campfire to entertain each other on the Friday night and after the headliner finishes on Saturday night." Early bird tickets are now available online for $30. They'll remain at that price until April 5, going for $40 in advance and $50 at the gate. Admission for children ages 12 and under is free, while youth 13 to 18 years old cost $15. Further ticketing details can be found here, while festival updates can be found through Go North Music Festival's official Facebook page.